Mudpies to Dragonflies: Tracy, These buns are for you! DANG woman, those look SO good. so, are you going to share the recipe???????!!! Forget the recipe where is my roll. I can not believe that you didn't bring me one. I am going to tell S that next time he needs to bring me one. You know he will make you!! PS just so you know the time is wrong it was 3:20 am. Thinking about you. Are you up? Awww, what a nice surprise to see my name on your blog! You wrote about some of my favorite childhood memories. 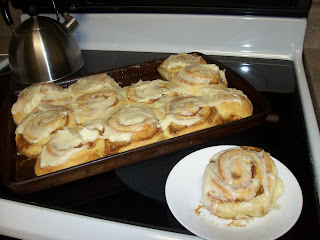 Your cinnamon rolls look soooo good. Can you mail me one? Don't worry, I'm still waiting patiently for my call. Love ya girl!